"Plastic water bottles should be banned." Or, should they? 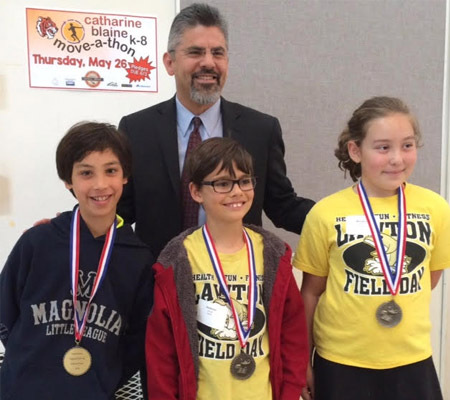 More than 60 elementary school debaters passionately argued this topic at DebateAble's fifth annual tournament at Catharine Blaine K-8 School (2550 34th Ave. W.), on May 21. Washington Supreme Court Justice Steven González, a Magnolia resident and DebateAble supporter, attended and addressed the audience of almost 200 debaters' friends and family members, debate judges, and other volunteers. DebateAble's program — geared toward upper elementary and middle school children — was developed by Queen Anne and Magnolia residents Elizabeth Kruse and Margot Saharic. All participants at Saturday's event were fourth and fifth graders from DebateAble's afterschool club programs at schools including Catharine Blaine, Franz Coe, John Hay, Lawton, McDonald and North Beach. The event was sponsored by Metropolitan Market, certificates were presented to every debater for their inspired presentations, and awards were given to the highest scoring teams and individuals. González, who has served on the Supreme Court since 2011, spoke during the awards ceremony where he celebrated increased voter registration in the midst of political turmoil, referenced birthright citizenship, and reminded young debaters of the immeasurable values of learning to debate. "The skills that you develop in debate class are critical to making sure that we keep the promise we've made to each other: that we argue for and defend the liberties given us in the Constitution,” he said. Elizabeth Kruse is the co-founder and director of DebateAble.